The fifth edition of this successful textbook is aimed specifically at those students and practitioners who require a broad understanding of building construction as part of a wider sphere of professional activity. The book provides a comprehensive introduction to the principles and practice of modern construction and services. New chapters on sustainability, ventilation and windows. This highly sought after text concentrates on principles and practice rather than details and regulations and retains it’s easy to follow format and highly accessible style. In doing so it enables the reader to demonstrate a comprehensive and genuine understanding of modern house construction and its evolution over the last 100 years. 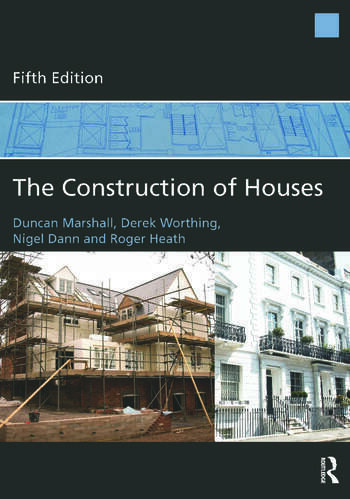 The Construction of Houses is not only an essential read for students, surveyors, developers and planning professionals, but also the interested lay person considering their first building project. Duncan Marshall, BSc, MCIOB, MIMBM was a Chartered Builder and Senior Lecturer at the University of the West of England, UK. Derek Worthing, BSc, MPhil, MRICS is a Chartered Building Surveyor and was formerly a Principal Lecturer at the University of the West of England, UK. He now works as a consultant and a visiting lecturer. Nigel Dann, BSc, MSc is a Senior Lecturer at the University of the West of England, UK. Roger Heath, FRICS, FFB is a Chartered Building Surveyor and was formerly a Senior Lecturer at the University of the West of England, UK. He now works as a visiting lecturer.